If you are looking for information on the Aim Mail franchise business opportunity, Aim Mail Center franchises or Aim Mail packing and shipping franchising, then you have come to the right place. Anyone who's ever raced from place to place on their lunch hour or taken time from their busy day to buy stamps, ship a package, or have copies made - only to be met with long lines, impersonal service, and limited hours - has probably thought to themselves, "There's got to be a better way." Now there is a better way, AIM MAIL CENTERS are one-stop business service centers that provide all these services and many more, all under one roof! AIM Mail Centers, a 20 year old company based in Irvine, California, has developed a unique and attractive franchise opportunity designed for motivated professionals. 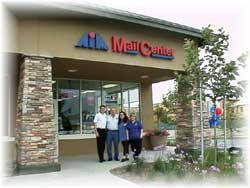 AIM Mail Centers are complete business service centers offering a wide array of products and services for large and small businesses plus general consumers. This includes shipping services with UPS, FedEx and the US Postal Service. We provide packaging, stamps, fax service, notary public, mailbox rentals, photocopies, office supplies and much more. Our advanced systems, extraordinary training and on-going field support make AIM Mail centers the right choice for entrepreneurs who want to be in business for themselves but not by themselves. The SOHO (small office/home office) based business market is growing at a remarkable rate. From a base of 6 million home offices in 1980, more than one in four U.S. workers in 53 million households is now regularly working at home at least part of the week. For the past five years at a rate of one every 35 seconds, someone has begun a full or part time business in their home. With this, as well as residential customers, the demand for shipping, postal and business services continues to boom.